Jakarta, April 29th 2014 - On April 27th 2014, Archipelago International and the famous favehotel brand gathered hundreds of people at the Bunderan HI monument to begin a “Fun Walk” in aid of Jakarta's weekly program, Car-Free Day. Car-Free Day encourages motorists in the vicinity to give up their cars for an entire day, to instead exercise and partake in physical activity. Car-Free Day is one of the Government of Jakarta’s programs to improve local air quality while reducing dependence on motor vehicles. 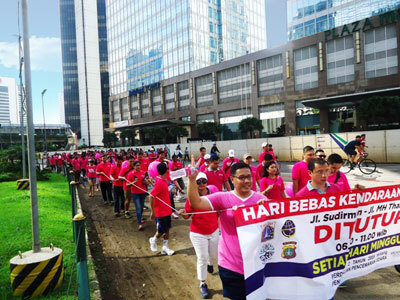 Although it was developed in 2007, the Government of Jakarta decided in May 2012 that Car-Free Day would be held every Sunday within the main avenues of the city; Jalan Sudirman and Jalan Thamrin, from Senayan area to Monas (Monumen Nasional) from 6AM to 11 AM. The program has been so successful in spurring on physical activity, the city has seen a dramatic increase in the number of cyclists on the roads. Therefore, to support the program further, Archipelago International and the favehotel brand held the Fun Walk to promote awareness of alternative forms of transportation, whilst also demonstrating the health benefits of more active lifestyles for everyone. "Car-Free Day is organized across the world in different ways, but every city shares the common goal of reducing the number of cars on the streets. In Indonesia, more than 50 percent of air pollution comes from transportation fuels, so it is more important than ever that we encourage less traffic congestion, a greener environment and a reduced demand on gasoline. With this in mind, we organized the Fun Walk to encourage people to get out of their cars to instead run, walk, cycle or use public transport. Not only did this decrease the city's pollution, Jakarta'a residents were able to maintain a healthier lifestyle for a day – without breaking the bank." said Norbert Vas, VP Sales and Marketing of Archipelago International. 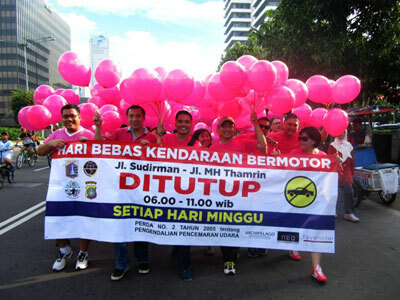 Seen in the image, hundreds of people supported the Government of Jakarta’s programs to improve local air quality while reducing dependence on motor vehicles by participated on fun walk. Seen in the image, Archipelago International and the favehotel brand held the Fun Walk to promote awareness of alternative forms of transportation.